Your Home Building Mentor Can Help You Build Your Own Home & Save 55% With Sweat Equity! Your Home Building Mentor is With You Step-By-Step! Yes, you can build your own house, and I'll show you how! What's the difference be between this site and other do-it-yourself sites? The word mentor. Your mentor will give you specific advice/instructions on YOUR specific house plan or project. While there is plenty of great general information here, you also can get the instructions & details you need for your situation. No one else offers this degree of service at this writing. Be Your Own General Contractor with detailed, specific information for your project. Save 55% With Sweat Equity! Save 25% Without Hitting a Nail! Remodel & Save either 55% with your labor or 25% overseeing your project. There was a time when the majority of people's homes and farms were paid for. This was the real American Dream - Home Ownership - Debt Free. You will likely end up paying over twice the price of your home in payments over thirty years. OVER DOUBLE THE INITIAL COST! You are probably giving away half your house payment every month. HALF. Or, because of these tough economic times, you may not be able to keep your home. I'll help you protect your future by helping you build a new home that cost less and gives you the space you need. Why not save over half the price of your new home immediately! Cut your house payment in half. Get instant equity. I've know people who have stayed in their home for a couple of years, sold it, make 55% CASH profit and did it again. After only four years they owned their own home outright and PAID FOR IN FULL!!! Some go on to actually make their living building only one house per year. At the very least, the quality of you life, debt-free, will be far greater than with the burden of a large debt and house payment looming over your head. 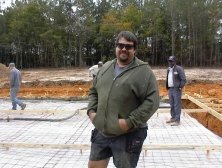 My name is Kent McKee, and I've been involved with home building since I was 14 - over 36 years. I built my own home, the first one, in 1986! So I know what I'm talking about. The people I've built homes for are amazed to see their dream homes be built. I've told people, "You could build your own home." And I've helped some of them do just that! Now you too can build your own house! Or build a room addition. Or remodel an older home. Even renovate a foreclosure. Make your own dream come true. You don't have to know anything about building. You can choose to pick up a nail gun (recommended over a hammer) and get the absolute most for the money you want to spend. I'll show you every step you need to take in the proper order. I'll be your personal mentor. Or if you don't want to do the sweat equity thing, I'll show you how to be your own General Contractor. We'll determine the real cost for building your new home. You'll learn how to hire the right professionals to actually do the work. And, most importantly, you'll learn how to KNOW if they're doing the work RIGHT! Save money. Save yourself costly mistakes. Any type of construction: new construction, log homes, kit homes, panelized homes, geodesic domes, concrete homes, etc. Just imagine saving anywhere from $25,000 to $75,000 or more! Each building topic is covered in detail so you can educate yourself before you begin your project. You'll want to understand not only the how, but the why before you begin. Let's get started! Click on the navigator buttons or the links below to get the information you need now. Your Home Building Mentor will help you realize your dreams!